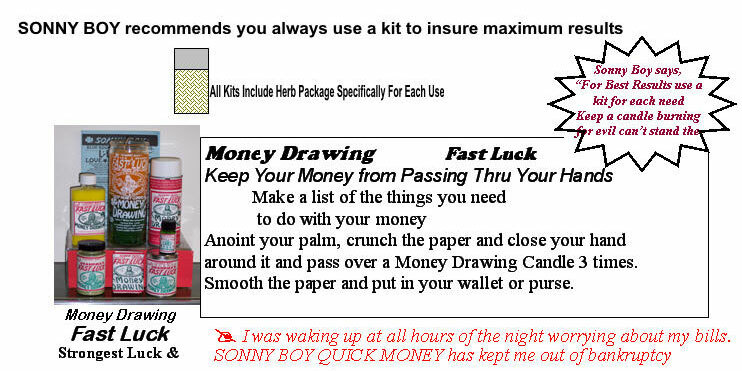 SONNY BOY® MONEY DRAWING FAST LUCK - spiritual and religious oils, incense, bath wash, salt crystals, sand, bar soap, spray, and candles. Keep your money from passing thru your hands. Make a list of the things you need to do with your money. Anoint your palm, crunch the paper and close your hand around it and pass over a Money Drawing Candle 3 times. Smooth the paper and put in your wallet or purse. SONNY BOY® 3-DAY QUICK MONEY - spiritual and religious oils, incense, bath wash, salt crystals, sand, bar soap, spray, and candles. Fast Action! Hard Working! Fast, Fast Results! For Specific Amounts, Pay Bills, Pay Debts. Nathan G. in Tampa says he uses QUICK MONEY for bills such as a car payment. He puts the amount he needs, and the purpose on white paper, and drops in QUICK MONEY OIL. He uses QUICK MONEY KIT for 3 days. They are strong. They always provide his blessing. He says this works for him anytime he needs it. Nathan prays the 23rd Psalm every morning. SONNY BOY® MONEY MAGNET - spiritual and religious oils, incense, bath wash, salt crystals, sand, bar soap, spray, and candles. Attract money like a bee to honey! Job...Business...Lawsuit...Claim...Benefits...Settlement...Lucky Numbers. Anoint yourself and your surroundings with Magnet items either oil or spray or incense ash...they are all good. Anoint a small magnet and carry it with you in a bag or wrapped in a white cloth. Burn Money Magnet incense, use a feather to draw the smoke to your hand or wallet, or wherever you keep money. Lucky Lodestone Magnetic Quality brings money to you. Magnetic Qualities! Energize Your Hand! Draw money like a magnet! You will use this product regularly after the 1st time. SONNY BOY says, Lucky Lodestone Perfume in the Special Items section is a good product for this. SONNY BOY® PAY ME NOW. spiritual and religious oils, incense, bath wash, salt crystals, sand, bar soap, spray, and candles. Money Release...Get money due from boss, loan, relative, friend, inheritance, lawsuit. Do this daily until your money comes to you. Use a PAY ME KIT for 5 days. when the money comes it will be quick. Write the amount you need on white paper. Write the source of the money on another white paper. Anoint each paper with oil. Daily - hold 1 paper in each hand, and say the amount out loud. SONNY BOY®MONEY TREE, GIVE ME MONEY - spiritual and religious oils, incense, bath wash, salt crystals, sand, bar soap, spray, and candles. The Money Tree supplies your needs everyday. Daily - Write the amount you need on a paper, with your name written 3 times, and pass over a MONEY TREE CANDLE, then pass it across your hand and across your front door entry 3 times. You are covered regardless of where your money is coming from. MONEY TREE, don't know where money is coming from, use this. Greed causes relationships to break up, and allows other evil influences into your life and causes chaos. SONNY BOY says, "Use 7 Holy Spirits items to guard against this." Sonny Boy is the #1 supplier of spiritual products and botanica. Strong! Dependable! Sonny Boy spiritual product's ancient recipes for incense and oils are the most powerful. Burn Sonny Boy Novena Alter Candles allow your prayers to communicate your need for God's blessings. 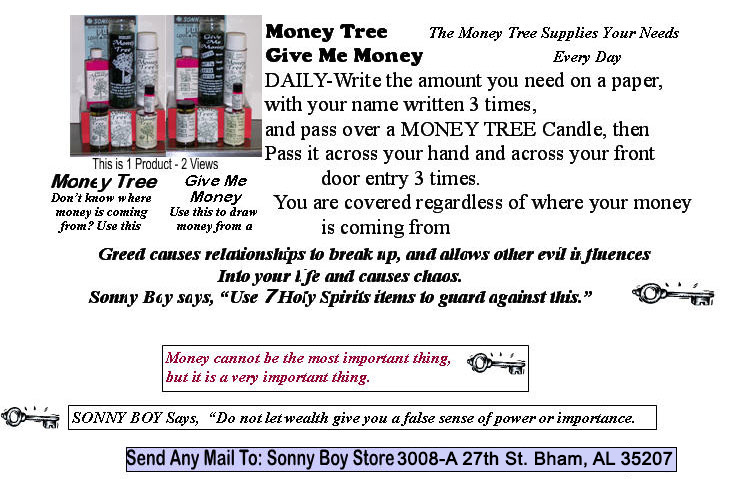 Let Sonny Boy spiritual products help you get the money you need. Identify the money you need. Will it come from your job, a loan you need, money from a friend or relative? Sonny Boy can help you get that money, and then you will need to know how and what to do with it. Read the Sonny Boy Blue Book for guidance on how to improve your control of your life, and how to handle your money. Burn Sonny Boy Novena Candles regularly. God wants his servants to have fruitful prosperous lives. Use any combination of Sonny Boy Fast Luck Money Drawing, 3-Day Quick Money, Money Magnet, Pay Me Now, and the Money Tree items. You will learn how each Sonny Boy product will help you. Read Sonny Boy Blue Book FREE online. You can depend on Sonny Boy Money and Luck products to provide your needs. Burn Sonny Boy Novena Candles, use the incense and oils and other items in the kits. You will draw the blessings you need.